Set to take over the broadcasting slot of Never Dance Alone <女人俱樂部>, Bosco Wong (黃宗澤) and Kate Tsui’s (徐子珊) The Ultimate Addiction <點金勝手> will begin airing on Monday, June 2. The story is set with Hong Kong’s fast-paced financial markets as the backdrop, in which ambition and greed often push the characters to extreme means. 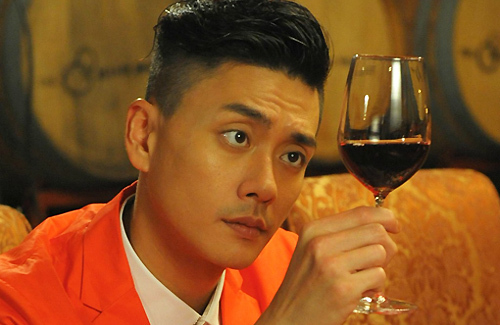 Playing a money-hungry CEO of his global investment company, Cheuk Yuk (Bosco Wong), along with his wife Fong Ming Yu (Nancy Wu 胡定欣), catch the attention of the Commercial Crime Bureau (CCB) due to illegal commercial behavior. As it turns out, before Cheuk Yuk started the company, he was dirt poor, and became friends with accountant Chong Chi Sing (Geoffrey Wong 黃子雄) who taught him the skills of investing. After a series of unfortunate failures which made him sacrifice, Cheuk Yuk met Ming Yu, who eventually became his second wife and turned him into the successful businessman he is today. Chi Nga (Kate Tsui) plays CCB’s fastest-rising officer. Going undercover in Cheuk Yuk’s corporation , Chi Nga gains Cheuk Yuk’s notice for her ability to quickly grasp the markets. Contrary to Cheuk Yuk’s past women, Chi Nga was not motivated by money. To avoid any suspicions from Ming Yu, Chi Nga pretends to be a lesbian. Under the pretense of working under CCB, Chi Nga may also have other secret personal motivations up her sleeve. Having been dating for quite some time, Chow San Yung (Ben Wong 黃智賢) and Ho Seung Yi (Sharon Chan 陳敏之) hit a bump in their relationship when San Yung’s ex-girlfriend, Chai Pui Fun (Elena Kong 江美儀) reappears. Years ago, San Yung and Pui Fun ended their relationship due to differences in their backgrounds. However, the loyal and dedicated San Yung is still willing to drop everything and help Pui Fun after all these years. Thinking San Yung still has feelings for Pui Fun, Seung Yi breaks up with him. In the finance world, where time is money, everyone would not hesitate to betray their friends and family. Cheuk Yuk and Pui Fun are rivals who try to profit from the turbulence of the financial markets, not noticing Chi Nga’s own plot for personal revenge slowly creeping upon them. Sorry, but Bosco Wang doesn’t have a look of a serious, badass, or successful CEO. Its a drama you guys don’t need take it that serious and you never know Bosco might do a great job. This only one picture he can look like a good boy in some eps of the drama. Its people these days who dont take things seriously causes TVB to be more si si dan dan. From the full MV, he does seem pretty badass..scheming to be exact. Another great role for him to shine. Kate, Nancy and Sharon’s’ characters looks really interesting as well. A bunch of greedy women with their own characteristics. Nope. Bosco definitely doesn’t have the look nor the acting skill to creditably pull this role off. Just because he’s a businessman and is good at it doesn’t mean he can play a role, remember, it’s a role in a movie, not a role in real life. Bosco’s acting is ok but i can imagine that if this were Ruco instead, he’ll certainly rock this role more than Bosco. Nobody plays evil as awesomely as Ruco, just watch him as badass Tony in When Lanes Merge, so cool, cruel, scheming and calculative. It is more than just able to play evil awesomely, but the actor must exuberate the qualities of authority, intelligence, self-control, leadership, etc, and Bosco as an actor doesn’t have any of those characteristics. I beg to differ, they never said anything about the character being evil. Besides like you said, Bosco is an actor..his job is to play the character, he doesn’t necessarily have to possess any characteristics of his character. It’s like assuming all those who portrays rapists and serial mass murderers on screen actually posses the quality of that type of cruelty. All those quality like leadership, authority and intelligence just seems a bit confusing..I don’t know why you would bring that up. Who cares what he’s like off screen, all that matters is if he can portray the character successfully. Besides, the series hasn’t aired yet…a but too early to judge isn’t it? From my personal prospective, Bosco is the only leading actor that has successfully portrayed all of the roles assigned to him so far. One quality he does have an advantage of is his versatility, which is rare for an actor at the company he works for. True but if anyone has any traits of any characters that they play, it will be a lot easier to play that particular character and make it more convincing. I think Bosco has the skills to pull it off. Lets wait and see since the series has not even aired yet. Wtf is with all the hate comments on Bosco. And no not Ruco again. Ruco may look like a pedo evil person without his glasses and contacts but the character not just about evil. And Ruco been exposed in like almost every few dramas for the past few years. Tvb is over prompting Ruco. Wtf is with all the hate comments from you about Ruco? I see you everywhere when there’s people commenting good things about him, calling him over promoted and what not. You don’t like him doesn’t mean others can’t like him. I think the actor who plays evil characters best is still Gallen Lo. Yeah he was incredible in Born Rich – which was pretty much The Gallen Lo Show towards the end. Tvb should give out awards to Actors/Actresses Who Saved the Show. Born Rich to me is one of the worst TVB drama. Is there other storyline, plot the writers can come up with. Are they out of fresh ideas? TVB has very low talent pool of creative writers. If they need new ideas, they should come to AMERICA.